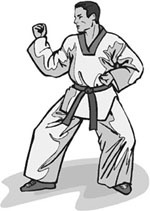 This collection of martial arts and self defense ebooks features the training methods and techniques from the US Military, Canadian Armed Forces, A.C. Cunningham, a boxing manual and the martial arts training techniques of the great Bruce Lee. This ebook package is just $4.99 and is available through instant download (*Please contact us first if you have problems downloading the ebooks). The techniques in these ebooks constitute Self Defense 101 that both women and men can learn to protect themselves. Hand to Hand Combat - Focuses on basic instruction, safety precautions, throws/takedowns, choke holds, grappling, short punches and strikes, striking principles, kicks, defense against a knife, knife to knife combat, vital targets/pressure points and rope combat. Close Quarter Combat - This military manual delves into the principles of unarmed combat, stances and postures, kicking, punching, blocks, elbow and knee strikes, holds and counter moves, knife fighting, bayonet/stick fighting, vulnerable body parts, and basic training drills. Martial Arts Training - The United States Marine Corps martial arts training manual teaches you how to use combat perfected techniques for personal self-defense. Bruce Lee's Speed Training and Strength Training - These two ebooks focus on the master martial artist's legendary techniques and training methods. They delive on Bruce Lee's unique take on physical training and his martial arts drills. Boxing - The Boxing Basics Manual teaches the scoring system, handwrapping, shadow boxing, sparring, jumping rope, fitness, stance, footwork, left jab, straight right, left hook, rules for punching, defense, and preparation for a boxing match. Its material is relevant for both the boxing pupil and for honing your self defense skills. The Cane as a Weapon - This classic 1912 book by A.C. Cunningham examines the use of a cane as a self defense weapon. The techniques can easily be extrapolated for use with any other stick based weapons. Buy this package now for just $4.99 and learn to defend yourself today! Perfect for both men and women. All sales are final, there are no returns or refunds. *Please contact us first if you have problems downloading the ebooks.